I have a certain in-law who, since childhood, has enjoyed eating “chicken and ducklings,” a dish perhaps better known as chicken and dumplings. Being vegetarian, my version of this dish contains neither chicken nor ducklings, but it’s packed with tons of flavor, protein, and other goodness to warm you from the inside out. As you’ll see, the recipe is just a starting point. You could make the dumplings and add them to just about any broth-y vegetable soup, and it would be delicious. Last night, Matthew made our Country Vegetable Soup using dumplings instead of pasta. Place lentils and bay leaf in large pot and cover with water. Bring to a boil and turn down to simmer. You may need to check back and add more water or broth as they cook. Chop your veggies. The ingredient list is just a starting point. You can add or subtract veggies as you wish. Green beans, potatoes, frozen corn, and/or frozen peas work well here, too. If you haven’t already made the dumpling batter, make it now. Saute onion/leeks and celery in olive oil until tender, about 10 minutes. Add garlic and saute for an additional minute. Add herbs and spices to the mix. Check on lentils. When they are starting to fall apart, add the sauteed mix, along with the other chopped veggies**, and more water or stock to the lentil pot. Bring back to a boil, and then lower to a simmer. If using water or no-sodium broth, you will need to add salt. Start with 1 t. and add more to taste. Once all veggies are in the pot, drop in dumpling batter by the spoonful. You will need enough extra broth in the pot for the dumplings. If your pot is too full, you can cook the dumplings in a separate pot of broth. Cover pot and cook dumplings for 15 minutes. Serve, let cool a bit so you don’t burn your mouth, and enjoy! *Split and hulled, these tiny lentils break down very quickly and will dissolve, creating a thick, rich base for the soup. **For ideal veggie cookage, start by adding the veggies that take longer to cook, like potatoes, sweet potatoes, carrots, etc. Let simmer for 10-15 minutes, then add tender veggies, like cabbage and green beans. Many frozen veggies can be added right at the end of cooking, and they’ll help cool the soup for eating. This entry was posted in Food, Recipes and tagged soup, vegetarian recipes. Bookmark the permalink. Hi! This soup looks and sounds amazing–I am so glad you mentioned it! Bob’s Red Mill is a favorite of mine. Yum! I love that you used lentils in the soup, too. Thanks, Kelly. We actually bought a big bag of the chickpea flour from Jay’s when trying to recreate the farinata we had in Italy. 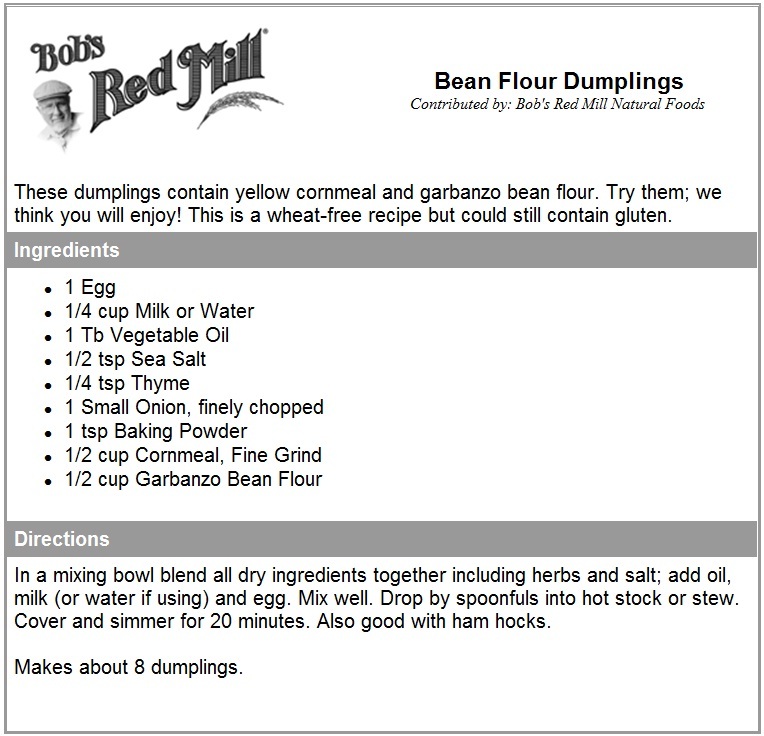 I realized I needed some other way to use the flour, which led me to the recipes on Bob’s Red Mill. There’s also one for a sweet potato and chickpea flour biscuit that I want to try, and apparently you can use the flour (instead of whole chickpeas) to make hummus and falafel as well.